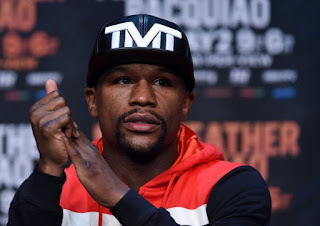 The world's highest paid athelete, Floyd Mayweather, who is in UK for his Undefeated Tour, was attacked over the weekend by an unknown attacker, who left his entourage van smashed and set ablaze. This is coming barely one week a burglar stole items worth $150,000 from his Las Vegas home. Centre in Birmingham Saturday night, when the vans parked outside the building was set ablaze. However, before Fire services who responded quickly could arrive, the van had burned completely. It was gathered that the attack was carried out by two men, who threw a Molotov cocktail into the vehicle after breaking its window with a brick. TMZ reports that the boxer (Mayweather) who is yet to release an official statement on the incident, has handed over the van hired for Mayweather’s promotions in the UK, to the police.